We have been friends since always, we are also husband and wife and the parents of 2 happy kids! We share the love and dedication for Yoga so together we built a space to inspire those who come to us, the same way we were inspired by our teachers. In a very easy and familiar vibe, we welcome you with arms wide open, as someone who opens its home to a long time friend. With a very similar path but really different characters we team up very well, working with enthusiasm in what we love the most! I started my Yoga practice and study in 2003 with Miguel Homem, it started from pure curiosity to a total addiction! In 2008 I started the first Yoga Teacher Training with Pedro Kupfer in Portugal, which I completed in 2009. Between 2008 and 2016 I studied Vedānta with Pujya Swami Dayananda Saraswati, my Guru, at the Dayananda Ashram, in Rishikesh, India. 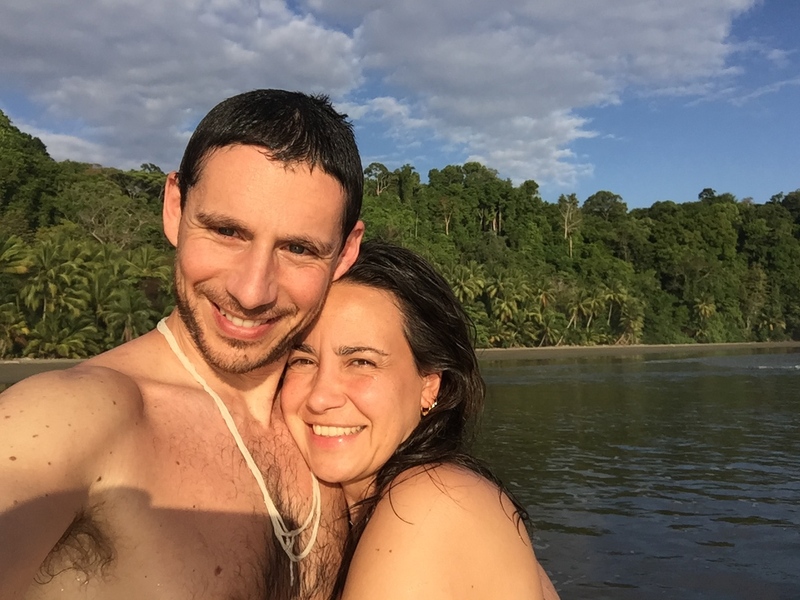 In this same ashram I got married and found out that Yoga is not a physical discipline destined to create wellness but a lifestyle that leads to freedom and reveals the truth about ourselves. Today, I keep my Vedānta studies with Gloria Arieira, organizing with Miguel her trips to Portugal. I also keep the study and practice of Yoga through the Iyengar approach with Cláudia Villadelprat with whom I practice regularly. Despite that I will always be passionate by the Ashtanga Vinyasa Yoga which guides my personal practice so I keep attending workshops and retreats on this tradition, namely with Tomas Zorzo, whose teaching trips to Porto I host, and who I consider to be my big inspiration in the approach of the ásana and pranayama practice. In 2010 I completed an Ashtanga Training (1st séries) with David Swenson in London and one year later in Greece with Manju Jois. My Hatha Yoga classes necessarily reflect both traditions – Iyengar and Ashtanga Vinyasa – combining a dynamic intensity with moments of detailed exploration of the yoga postures. In Yoga I found a sense to life, an order in this apparent chaos and an ethical code, which guides me and which I try to pass along by helping my children to grow with this same values. I’m a Yoga teacher and a Vedānta teacher although I see them as one. I started teaching yoga in 2002, after studying with my first teacher, Luís Lopes. In 2004, I studied Tantra and meditation with Dada Dhyanananda. From 2004 to 2011 I deepened my asana study and practice, through the Iyengar method with Cláudia Villadelprat, and recently I started practicing with her again. I completed the Yoga Teacher Training with Pedro Kupfer, in Brazil, (2005/06) and in Portugal (2009/10), as participant and host. Between 2005 and 2015 I travelled annually to India to study Vedānta at the Dayananda Ashram in Rishikesh, with my Guru Pujya Swami Dayananda, having also studied with other teachers such as Swami Paramarthananda. Pujya Swamij’s maha samadhi happened on the 23.09.2015. In 2006 I met Gloria Arieira, with whom I learn vedānta and sanskrit, and for whom I nurture an enormous care and admiration. Later on I started hosting her in Portugal to teach at Casa Gaṇapati. In December of this same year I founded Maṅgalam, with Paulo Vieira, a group dedicated to spread the devotional indian mantras – Kīrtanas and Bhajans. In 2007 I started studying yoga and ayurveda with Vamadeva Shastri (Dr. David Frawley of the American Institute of Vedic Studies). In the same year, through Atreya Smith, I met Ganga Mira, Papaji’s disciple, and started visiting her regularly to assist attend her Sat Saṅgs, taking assuming her as a Master in my nididhyāsana. I met Tomas Zorzo (aṣṭāṅga vinyāsa and yoga integral) in 2008, and started learning from him as my aṣṭāṅga and prāṇāyāma teacher in Kṛṣṇamāchārya’s tradition. Tomas is a friend, a teacher and a constant inspiration. In 2008 I also learned the art of Thai Yoga massage with Choenzom Emchi. 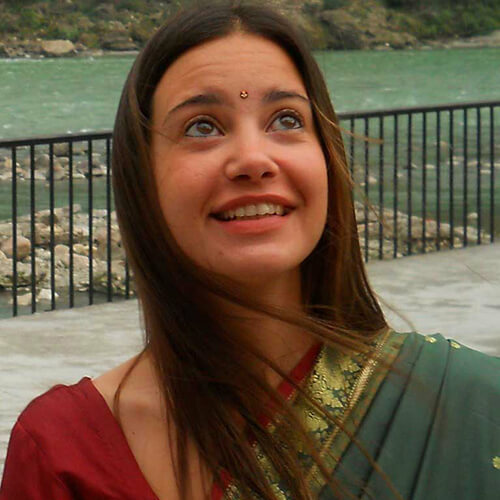 At the end of this year, by Swami Dayananda’s orientation, I started weekly sat sangs to study the Bhagavad Gita and kept them until my daughter’s birth my daughter was born. These sat sangs were open to everyone and they were also recorded. They are available online at Dharmabindu. In 2010 I made an aṣṭāṅga vinyāsa yoga training (1st series) with David Swenson. In 2011 I met Andrés Wormull (Manju Jois’s disciple) with whom I learned Aṣṭāṅga Vinyāsa and Vedic Chanting and who inspired my way of teaching within the vedic tradition. Still in 2011 I completed another aṣṭāṅga vinyāsa yoga training, this time with Manju Jois. 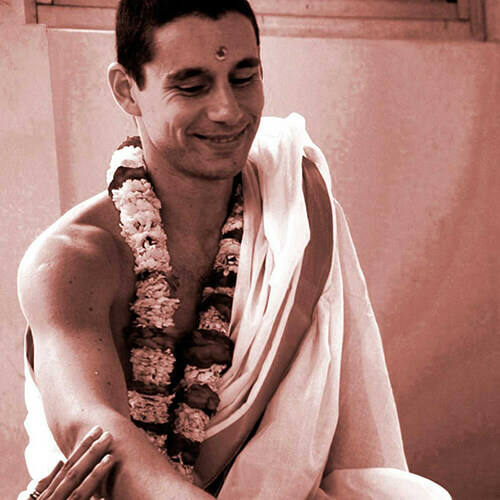 The way of teaching aṣṭāṅga within the vedic tradition of Andres and Manju, without forgetting the importance of prāṇāyāma, vedic chanting and vedānta, motivates and inspires me in my personal practice and in the classes I teach. In 2012 I completed the 300h Yoga and Ayurveda course with David Frawley, recognized by the American institute of Vedic Studies. Throughout the years I kept learning with many teachers from different traditions, some famous others totally unknown, but to all of them I owe part of what I am today. I teach Yoga as a whole in the Vedic Tradition of advaita vedānta in Ādi Śaṅkarāchārya’s line, I teach Hatha Yoga according to the ancient texts inspired by the legacy of Kṛṣṇamāchārya and aṣṭāṅga vinyāsa as I learnt from my teachers. I teach at Casa Gaṇapati, I lead courses and retreats all over Portugal, I write articles for yoga websites and for some time I was a member of the editorial council of the yoga magazine “Cadernos de Yoga”. www.dharmabindu.com, a study website about Yoga and Dharma and I teach a Yoga Teacher Training Course at Casa Gaṇapati, Porto and Yoga Mandir, Parede (Lisboa). Above all I try to convey a vision of yoga as a lifestyle compromised with committed to / within in a non-dualistic approach of (the) existence, revealed which is unveiled by advaita vedānta. Through the practice we try to bring Yoga to the daily life where it is needed the most!